There was a time when Adelaide United was Melbourne Victory’s bogey team. But it was too brief and, worse, it was a long time ago. In February 2007, one moment changed everything. Back then the A-League finals series used the double chance. First would play second, over two legs, with the winner advancing to the grand final (which it would host) while the loser would get another shot in a match against the winner of third versus fourth. After the first leg of the “major semi final” against Melbourne Victory in the 2006-7 season, Adelaide United was well placed. United and Victory had drawn 0-0 at Hindmarsh. With the away goals rule in place, a score draw in the second leg in Melbourne would be enough to put the Reds straight through to a grand final in Adelaide. That would have been a massive blow to Melbourne Victory which had comfortably been the best team throughout the season. But it might have also reminded the Victorians that Adelaide United was their least favourite opponent. That 0-0 draw was the seventh A-League meeting between the clubs and the tenth in all competitions. Melbourne Victory won just two of those matches. Going into injury time of the major semi final second leg (at Docklands Stadium), the score was 1-1. United was just minutes away from direct qualification for the grand final and hosting it. Victory won a free kick on its attacking left and threw players into the penalty box in a desperate attempt to score from it. We see this often in soccer when a late goal is needed; it rarely works. And it shouldn’t have worked on this occasion. The ball found a crowd of heads and was deflected to the far side where the only Victory player lurking was James Robinson. If United can’t find that ruthlessness, the up-coming A-League campaign will go the same way the last two did – plenty of plaudits but no end-of-season trophies. Robinson should have been marked, but he wasn’t, and that freedom allowed him to guide a looping header over Reds’ goalkeeper Daniel Beltrame. And in that moment, the United-Victory rivalry changed. For good. The grand final was played at Docklands two weeks later and Victory famously beat United 6-0. Of course we can’t say that Victory wouldn’t have won emphatically if Robinson hadn’t scored that goal in the semi and the grand final was played in Adelaide. But it seems so unlikely. Victory played extremely defensively in the aforementioned 0-0 draw at Hindmarsh and didn’t manage a shot on goal in the entire match. And rather than go into a home grand final with their tails up after a dramatic win in the semi, the Victory players would have needed to regroup for a preliminary final against a strong Newcastle side to qualify for the season decider in Adelaide (where they’d face a team they struggled to beat). 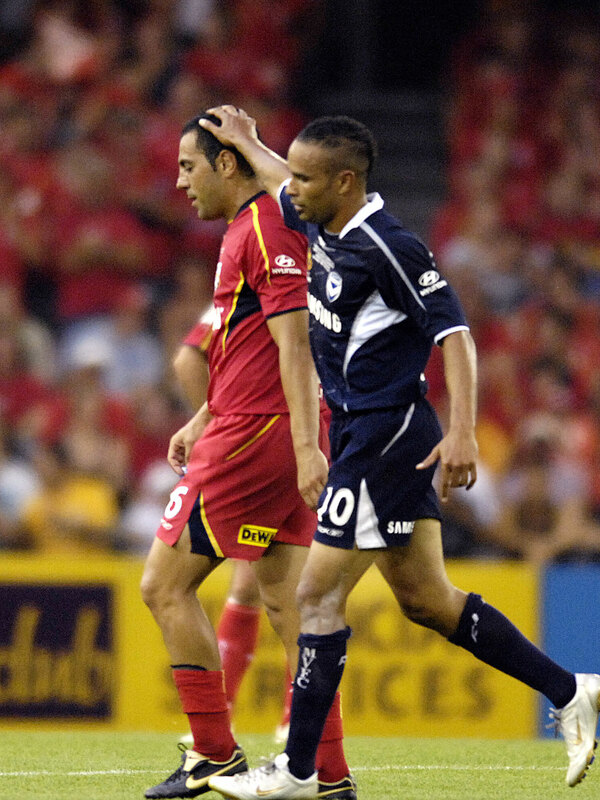 Since the 2007 humiliation United has recorded six A-League wins against Melbourne Victory. But they’ve knocked us over 14 times and that included a ten match winning run (and another grand final) between September 2008 and January 2011. The Reds ended the streak with a memorable 4-1 triumph at AAMI Park. But another streak is in the making. United has failed to win in its last six matches against Victory. More worryingly, the Reds took the lead in four of those games. Those were also the six matches of the Gombau era which saw United play skilful and attractive soccer but often not capitalise on its good work. Last season the Reds failed to win six games they led in (three draws; three losses). Teams that win championships are better at holding on to leads. They usually have the ability to change gears in a way that makes sure opponents rarely get a look in. And if we keep falling in a heap against Melbourne Victory, particularly from winning positions, it’ll be hard to escape the conclusion that our old nemesis has a psychological edge over us. The next chapter in the rivalry between the two teams will be played at AAMI Park tonight. It’s an FFA Cup quarter final so it’s not strictly an A-League match. But history lifts the stakes. A United win would provide a confidence boost (for the fans as well as the players) before the two sides meet again at Adelaide Oval on October 9 in the first round of the new A-League season. But a loss would continue a familiar pattern. Having won last year’s inaugural FFA Cup, United takes a proud record of seven wins out of seven in that competition into tonight’s game. Wouldn’t it be typical if it’s Victory that brings our run to an end? Had it not been for James Robinson’s intervention in February 2007, the record between the two clubs might be more balanced. He scored just one goal in seven appearances in his only season with Victory. But if I ever imagine some sort of curse is hindering the Reds when they face their greatest foe, I think back to that moment. Forget Archie Thompson or Kevin Muscat. It’s the Robinson Curse. A win tonight won’t be enough to reverse it. But it would give us the hope that all underdogs need – the hope that we’ll get there one day. Paul Marcuccitti’s soccer column is published in InDaily on Mondays. He is a co-presenter of 5RTI’s Soccer on 531 program which can be heard from 11am on Saturdays.